We utilize the safest available anesthetics to provide that extra margin of safety, especially for our older or high risk patients. Using the most modern equipment, the patient’s vital signs are monitored during all anesthetic procedures. Intravenous catheters and fluid therapy are a must during all general anesthesias as well as appropriate pain medication. We recommend several local boarding facilities as well as pet sitters. We recommend checking the phone directory or internet for groomers. We are not set up in our facility for this service. There are mobile groomers available. ECG’s are evaluated by boarded veterinarians at the Institute of Veterinary Specialists in Gainesville via telephone. If a more extensive cardiac evaluation is needed echocardiograms are available once a month here in Jacksonville. Dental care is very important to pets. Under general anesthesia,we provide ultrasonic scaling and polishing of the teeth as well as any needed extractions. 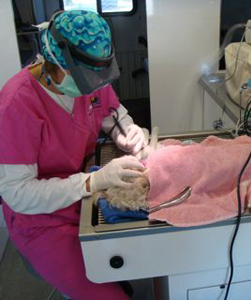 For extensive dental work such as orthodontics, root canals, fractured jaws and other surgeries involving the oral cavity we refer to Dr. Sharon Hoffman – our local boarded veterinary dentist. Our mobile clinic is equipped to provide diagnostic and therapeutic services to care for your pets’ complete health care needs. Please call our main telephone number for instructions for after-hour emergencies. We are not available on nights or weekends and the emergency hospitals are fully equipped to care for your pets. We utilize commercial veterinary laboratories for specialized diagnostics and consultations. If you pet is diagnosed with cancer we recommend an assessment by the team at Southeast Veterinary Oncology. They will work closely with us to provide the best care for your pet. Our separate state-of-the-art surgical suite, while small, provides for the performance of a wide variety of surgical procedures. Dr. William Pope is our specialty surgeon and provides on site orthopedic services as well as advanced soft tissue surgeries. He has over 30 years of surgical experience and recently completed a three month program called the Charlie Bild VIP fellowship at the University of Florida, Gainesville, Florida where he studied both orthopedic and soft tissue surgery. Dr. Alan Weldon, DVM, ACVIM provides ultrasound services in the veterinary van by appointment.